Long-standing club captain Nathan Pond says this Fleetwood squad has the same team spirit as the 2011-12 National League winners. 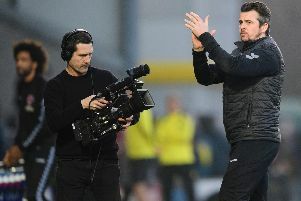 Pond, who has been at the club since 2003, is reflecting on Town’s highest-ever finish to a league season, fourth in the third tier. And asked how the historic campaign compared with his previous 13 at Highbury, the 32-year-old said the current close-knit bunch are up there with the non-league champions of five years ago. That Town team famously featured Jamie Vardy, who has since won 15 England caps and helped Leicester to win the Premier League 12 months ago. Pond signed a one-year contract extension in January, ensuring he will spend a 15th year at the club with an option of a 16th in 2018-19. Pond says the strength of Town’s team spirit was proven by their 18-game unbeaten league run from November to March as they developed a top-six mentality. He said: “It is definitely up there with the Conference side. There is a great team spirit. “All the lads get on. There are a few arguments on the training ground but that is to be expected just because we want to get the best out of each other. Pond came off the bench to replace the injured Cian Bolger in the final game of the regular season against Port Vale and the centre-half started the first leg of the play-off semi-final, in which Rory McArdle scored Bradford’s all-important goal at Valley Parade. Bolger returned from his ankle injury for the goalless home leg, in which Pond was an unused substitute. The skipper knows it is a squad game and said: “The lads gave everything they have got. “If you are not playing, you have got to be there to support your team-mates. “That’s what I did against Port Vale. I was on the bench and came on when I was needed. While Pond is already tied down, it is anticipated that the club will confirm its retained list this week.